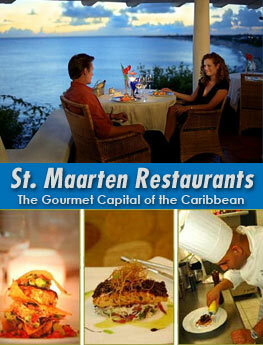 Many people debate the best restaurants in St. Maarten, St. Martin and it's always a difficult subject. Why? Because there are so many great restaurants that even those living here have not dined at them all so who’s to say? Therefore, the far easier subject would be which is the worst restaurant as this is a singularity. 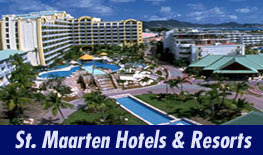 The worst restaurant in St. Maarten, St. Martin? 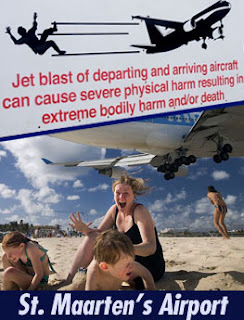 Without question it’s "Matthew’s Happy Landing" and should you by some unfortunate accident or mis-direction actually land here, you’ll be trying to take off again as soon as possible. The restaurant was opened in May of 2008 by Matthew Miggins whose culinary philosophy was twofold. 1) Shovel the stuff out and 2) Make as much cash as possible before they shut the joint down. This dual philosophy has earned Miggins every "reverse accolade" possible and not nearly the amount of "cash" he had anticipated. The restaurants décor can best be described as looking just like someone's house and in fact it is. Well sort of. Miggins found an abandoned dwelling, gave the front of it a coating of whitewash, bought some bridge chairs and a hot plate and opened to the public. An evening at Happy Landing always begins with music and song performed by Miggins himself. As many customers tended to leave at this point, Matthew decided to lock the doors once everyone was inside. “Let them try it now” he smiles. The cuisine (a very generous term when describing the food) is said by Miggins to be Authentic Dutch Historical (which is true when checking the dates of purchase of many of the ingredients). This “cuisine” is, however, totally unknown to the Dutch themselves as are such arcane dishes as “Shmurgie”, “Vloop”, and the house specialty “Phluggers”. When asked about this, Miggins always chuckles and winks. Any inspection of Happy Landings pantry will leave one undecided as to whether Miggins is storing ingredients or making penicillin. The restaurant was the center of a legal controversy 30 days after opening when Miggins defended in court the validity of “road kill” as a legitimate supply source. He lost the case and can now be seen on occasion, grumbling as he browses the meat department of a local market. As all dishes at Happy Landing are prepared on hot plate by Miggins himself (who also functions as host, bartender, waiter, busboy and general annoyance) the service is necessarily slow. If you order at 7:00, it would be best to bring a book or, if inclined, take a nap. In addition, Miggins’ policy is “pay in advance”. An unusual policy to be sure but one that became necessary as more and more patrons were refusing to “pay after”. 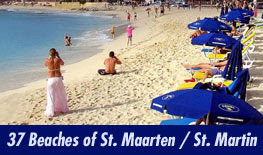 Some recent reviews of Matthews Happy Landing in the St. Maarten, St. Martin media are as follows: Harold Raxlen “unbelievable”, James Morris “is this legal?”, Francois DuPuis “Merde” and Ronald Cutulli “you’ve got to be kidding”. Phone for reservations: 526-2286. If no one answers, you’re ahead of the game. I'm going to watch out for brussels. I will appreciate in case you proceed this in future. Numerous folks might be benefited out of your writing. Cheers! a lot quicker then most. Can you recommend a good web hosting provider at a fair price?